Eat your broccoli! Not just because your mother told you to, but because it really is good for you. Whether it’s served as a simple side, roasted or mixed into a tasty Italian dish, broccoli packs a nutritional punch. Green up your fall menus with these delicious broccoli recipes: Green & White Roasted Vegetables, Vegetable Lasagna with White Sauce, Broccoli Rabe with Pancetta and Garlic and Broccoli Slaw. Broccoli, cauliflower, turnips, garlic, shredded arugula and cabbage combine in this rustic roasted vegetable recipe. Our vegetable lasagna features fresh chopped broccoli and diced red bell peppers for a healthy punch of color. Three cheeses add creamy texture. In this easy recipe, broccoli rabe, pancetta, garlic, golden raisins and toasted almonds are sauteed in olive oil to create a bright side dish. Broccoli, carrots, red bell pepper and apple add layers of fresh flavors to this broccoli slaw recipe. Long associated with Italy, broccoli (the name comes from Latin for “arms” or “branch”) has become an American staple. For a little variety, try one of its lesser-known relatives. The slightly sweeter broccolini, also known as baby broccoli (which is what it looks like), is a hybrid of traditional broccoli and Chinese kale. Broccoli rabe, sometimes called rapini, has a pungent, bitter flavor and is much used in Italian and Chinese cooking. When shopping for broccoli, look for tightly closed, dark green or even purplish florets (yellow means it’s past its prime). Sometimes broccoli stalks—especially the larger ones—develop a woody skin, but this can easily be peeled off. Broccoli rabe and broccolini are both completely edible—just trim any wilted leaves or tough stems. 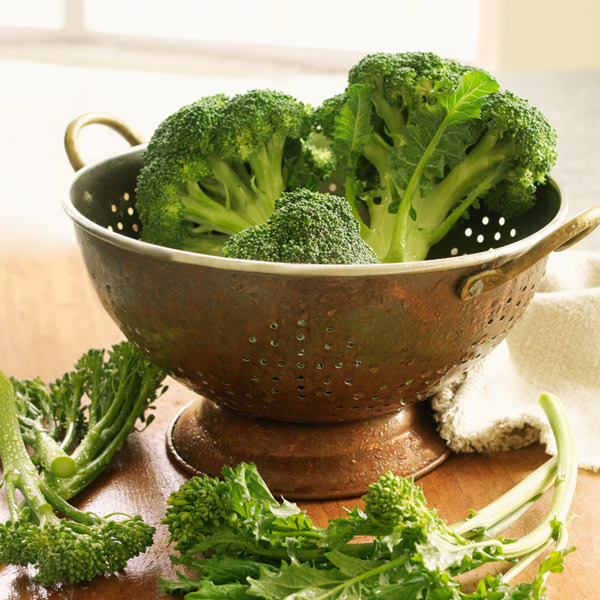 And if you’re serving broccoli raw, the best choices are blanched traditional broccoli and tender broccolini. Along with its cruciferous cousins—cauliflower, Brussels sprouts and cabbage—broccoli is a dynamo in the nutrition department. One serving of broccoli will give you a good dose of vitamin C, plus beta-carotene, lutein (an antioxidant that protects the eyes), and the B vitamins folate and riboflavin. Broccoli also has powerful phytochemicals to help your body reduce the risk of cancer, heart disease and osteoporosis. Broccoli is an edible flower: Those florets are really clusters of tiny flower buds. Broccoli wasn’t widely available in the United States until the 1920s, when farmers in California began growing it commercially. Over the past three decades, consumption has grown more than 900 percent! The most popular variety of traditional broccoli is known as Calabrese, named for Calabria, the province in Italy where it was first grown. Although most people trim and toss broccoli leaves, those cast-offs contain even more beta-carotene than the florets. So leave them on or add them to a soup.